Whenever an encounter with a piece of ice protecting this server ends in which the Runner broke at least one subroutine, he or she loses click, if able. "They say he is an ex-runner. I don't know if it is true, but he is chromed to the gills and seems to know all the runners' tricks." Mason Bellamy lets you reduce the number of clicks the runner has during and after a run. He doesn't stop a run and he doesn't have much to prevent being trashed (3 isn't high enough to protect an annoying sysop). How much value he adds to your setup depends on how well you are able to capitalize on a runner who's running out of clicks (pun intended). There are some obvious synergies. Bioroids are much scarier if you can't click through them. Data Raven presents a difficult choice when the runner doesn't have a way to clear the tag (just watch out for Aaron Marrón). 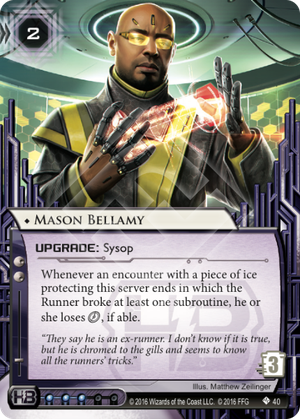 Manta Grid gives an extra click (though you can bet the runner will trash either Manta Grid or Mason Bellamy to avoid that trick working twice). Ryon Knight gives a brain damage. And when the runner trashes Bellamy in response, well, he and Knight have some Friends in High Places. Especially the Knight/Bellamy/Friends combo feels like it could work well enough to make a server with three pieces of gear check ice be scary even in the late game. There's also Heinlein Grid. If the runner breaks any piece of ice they lose a click (Bellamy) and thus all credits (Heinlein). Trashing this combo is going to be a bit of a problem when the runner has no credits. Add a piece of cheap ETR ice behind something the runner has to break and the runner isn't even going to see the inside of your server. A traditional deck (lot's of economy and ice breakers) is going to be locked out by that setup. Ice destruction (anarch) and bypassing (criminals) could still work, but even getting hit by the combo once is going to be a major tempo hit. Alternate cost breakers (e.g. Faust, Shiv) work well enough to get through to the server, but still leave the runner with an empty bank account. Temüjin Contract and other cards that pay out on successful run do give the runner a bit of money back which they could use to trash the combo, so it's best to stop them from reaching the server in the first place. Cards like Guard (no bypass) and Self-Adapting Code Wall (no Parasite) are your friend here. Against cutlery/Eater there isn't a silver bullet though, Architect can be run through without breaking so it's not good enough to prevent the combo being trashed. EDIT: Added Heinlein Grid, thanks @Lynx Kuroneko.